Very Positive (147) - 89% of the 147 user reviews in the last 30 days are positive. Very Positive (3,747) - 88% of the 3,747 user reviews for this game are positive. 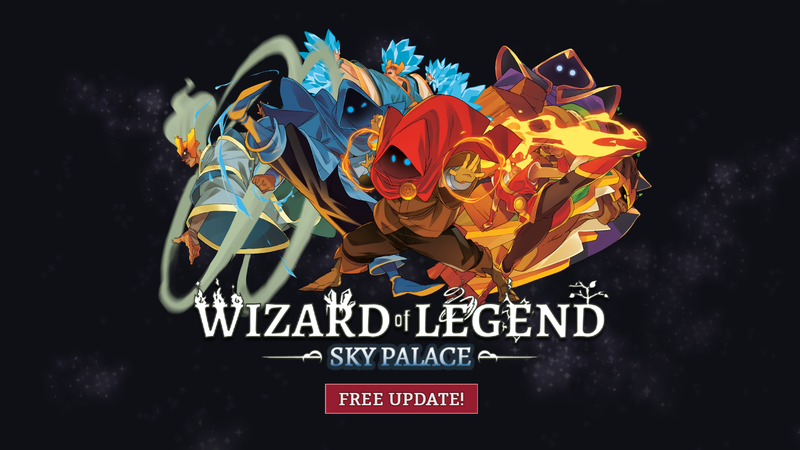 We’re happy to announce that the free Sky Palace update will be going live today! Please note that if the update does not immediately show up for you, try restarting your Steam client. You can verify that the update was applied by checking the version number in the corner of the titlescreen (should be v1.1). Thank you again for all the support you’ve shown so far for Wizard of Legend! We’re back with another update and this time we’ll be going into a bit more depth on the changes the Sky Palace will bring! But in case you missed it, be sure to check out the teaser trailer for the update here! One thing we’d like to address is that we’re expecting the Sky Palace to launch in the early months of 2019 rather than at the end of this year as initially planned. We’re still in the process of putting the finishing touches on the update and we can’t thank you enough for your support thus far. The game will be automatically updated when the Sky Palace goes live. The first thing we’ll be showing off is the often requested Endless Run mode! Once you’ve cleared the chaos trials, you’ll find that a very mysterious old man begins to show up towards the end of the trials. This old man will allow you to spend some of your hard earned chaos gems to loop to the beginning of the trials with all the powerful artifacts you’ve collected on the way. However, upon looping to the beginning of the trials, you’ll find that things aren’t quite as rosy as you remember them being as all enemies will be significantly more difficult! But if you can survive, you just may be able to become the perfect wizard that you always dreamed of becoming! Also, Nox the Unfortunate has now set up his cursed relic shop in Lanova Plaza. Though they’ll come at a steep price, these relics will be a bit more powerful than the standard curses and will drastically affect the trials as a whole. While we’ve gone back and given several of the original arcana new signature versions, Tectonic drill is a favorite of ours! In its signature version, wizards fire off a barrage of miniature drills before following up with a massive drill of gigantic proportions! The second signature is a new arcana added in this update, Dragon Surge! This arcana fires off watery dragons that swim around the stage while torpedoing through enemies to disrupt them! That’s all for this update! Thank you again for your awesome support and we’ll do our best to get the Sky Palace update out as soon as possible!